How have Americans reacted to Nicola Sturgeon’s visit? The visit of First Minister Nicola Sturgeon to the United States has ruffled some feathers back home in Scotland. Opposition politicians object to the trip, accusing the First Minister of jetting off to America rather than dealing with domestic political issues. There were also eyebrows raised when Ms Sturgeon took to the United Nations to talk up Scotland’s place in the world, seen by many as a pitch on independence. “Spinning” by the First Minister’s aides and political allies also sparked anger when investment by U.S countries in Scotland ‘won’ by the SNP Leader was found to have been brokered much earlier by a quango that Ms Sturgeon hadn’t influenced. Those hiccups aside, it seems to have otherwise been a successful trip for the First Minister. But what did our friends across the pond make of it? We look at the reaction of Americans to having Scotland’s most senior politician in their country. Diplomacy is often all about optics – and by that measure Ms Sturgeon’s trip to the US was a roaring success. Avoiding the Washington home of the new Trump administration, the First Minister instead went to America’s liberal heartlands. She met with California Governor Jerry Brown, who is seen by many as the face of the anti-Trump movement in American State politics. While in California, Ms Sturgeon signed a climate change agreement with the Governor. By those markers, then, her engagements, especially on the West Coast, were a successful piece of engagement. Things got even better when Ms Sturgeon gave a well received speech at the United Nations, and was introduced to political A-listers at a ‘Women in the World’ event in New York. That conference, her last engagement before returning to Scotland, saw the First Minister meet former Presidential candidate Hillary Clinton. Crucial to foreign trips for political leaders is gauging how much positive media response you can glean from outlets in the country you’re visiting. USA Today carried a reprint of a Herald article, while the First Minister’s trip to Silicon Valley was covered by both the Associated Press and ABC News. NBC covered the visit on their California stations too. Ms Sturgeon’s willingness to meet with President Donald Trump despite being a stern critic was featured on Fox News, the most-viewed news network and the one that is most naked in its support for President Trump. Any positive coverage or contact from that network was unlikely, as they prefer their UK contributions from pro-Trump siren voices like Nigel Farage and Katie Hopkins. 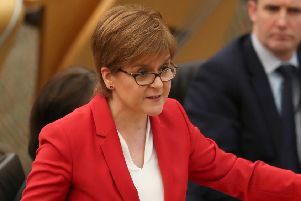 Despite it being a factor in politics in California since the election of Trump, Ms Sturgeon wasn’t asked about ‘Calexit’, the prospect of California seceding from the US or being split into a number of different states. The First Minister, an avid and popular user of Facebook and Twitter, would most likely have been keen to see what impact, if any, she was making online. Perhaps the most significant impact was late last night following her Women in the World appearance, when by one analyser the First Minister was ‘trending’ on Twitter in New York. Also giving the First Minister a boost was the reaction of the Women in the World organisers themselves. The discussion with Nicola Sturgeon which was uploaded to the official Youtube channel of the conference billed the SNP leader as ‘The Queen of Scots’. Women in the World founder Tina Brown was full of praise for Ms Sturgeon, who she wasn’t shy in equating to former Secretary of State Mrs Clinton, the star attraction at the event. Ms Brown captioned a picture of the trio with “Backstage @womenintheworld with @HillaryClinton and First Minister @NicolaSturgeon two women I admire most anywhere”. Even being mentioned in such company and in such positive terms means that as far as social media goes, the First Minister had a big impact across the pond.